The Lili Marleen is a 249ft luxury yacht which is currently available for private charter anywhere in South East Asia. 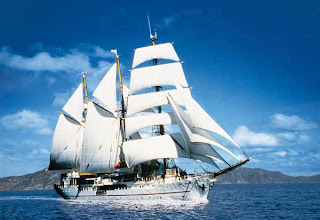 Built in Elsfleth, Germany in 1994, this magnificent three mastered Barquentine is the perfect vessel to cruise the pristine waters of the Andaman Sea and showcase the spectacular views of the region. The Lili Marleen provides the ideal setting for a luxury cruise where your needs will be the centre of attention. Whether as a venue to invite business partners for meetings, to reward your top producers, or just to unwind and relax, the Lili Marleen is the perfect location. You determine the sailing program; our crew will do the rest. Once onboard the Lili Marleen, you and your guest will be treated to world-class service, a romantic setting and a memorable experience. The Lili Marleen is luxuriously furnished, emulating classical Renaissance elegance and equipped with three VIP Suite on the promenade deck and 22 Deluxe Cabins on the lower deck. Each Suite and Deluxe Cabin is outfitted with classical European furnishings and amenities. All staterooms are air-conditioned and en-suite. The facilities onboard are catered to the guests’ requirements in order to maximize their sailing experience. Whether it’s relaxing in our lounge, enjoying al-fresco dining on the Palaver Deck, getting lost in a book in our onboard library or enjoying a romantic dinner under the stars, there is a wide range of activity for everyone. Top chefs can prepare a festive menu of both local and international specialties which can be served anywhere on the boat. The Sun Deck will be the main area of activity for most passengers during the day time, where guest can either laze around on the deck chair soaking the sun or participate in helping out the crew man the riggings. Water Sport activities are also available onboard. These include both motorized (jet-ski, water-ski) and non-motorised (snorkeling, scuba diving, etc.) activities. We can also arrange shore excursions to a private beach for a BBQ lunch or dinner. As the day unfolds towards the evening, guest can unwind in our lounge. The lounge provides a luxurious ambiance enhanced by its paintings and fittings fashioned in superb hardwood. Our onboard AV system equipped with karaoke will keep guest entertained throughout the evening. A well stocked bar provides a wide variety of beverages including premium wines, champagne and spirits. Our bartenders can prepare exquisite cocktails of all types. Not to forget our vast movie library to entertain all guest onboard anytime of day. Lili Marleen can take you around sunny South East Asia like you’ve never seen it before. Sail through the Straits of Malacca and call at historic ports and beautiful islands on the way. Or you may prefer to journey to Indonesia and follow the route of the Dutch East India Company to Batavia or Bali. Why not opt for a cruise along the coastline of Siam to Burma. It’s entirely up to you. The Lili Marleen can tailor make an experience to suit any requirements. MALACCA: The recent arrival of the ocean-going sailing vessel ss Lili Marleen at this historic port city has brought forgotten images of the state’s glorious maritime to history life. Known as a tall ship, the 76.6m Lili Marleen is a three-masted sail ship with over 1,208 square metres of sail, and the only one of its kind plying the Straits of Malacca. Tan Sri Halim Mohamad, CEO of the ship’s owner, the Halim Mazmin Group, recently weighed anchor off the coast of Malacca to offer trips for those wishing to experience a sail ship. “We were invited to sail to Penang but chose Malacca as it was here that hundreds of sail ships called during the Sultanate Era 600 years ago,” he said, adding that Malacca Chief Minister Datuk Seri Mohd Ali Rustam requested that the ship be stationed here. He said the company, which has been in the oil and gas transportation business for over 18 years, purchased the fully-rigged wooden-hull ship for six million Euros to lease it as a floating hotel or a venue for social and private events. Fully rigged: The three-masted Lili Marleen anchored off the coast of Malacca recently. “The ship, whose finishings and facilities are comparable to a five-star hotel, can make ocean voyagers by sail or engine power,” he said. Lili Marleen is named after two different singers made popular by the German army during World War II. The ship has three decks, with the promenade deck consisting of three deluxe cabins, Lili’s bar, and a library sun deck. The main deck includes two cabins with upper and lower berths, reception, a restaurant, lounge bar and a laundry while the cabin deck includes 19 outside cabins and a first-aid post. He said the company would collaborate with the state to use the ship to promote Malacca as a tourist destination. “It is timely that Lili Marleen is anchored off here as Malacca was a famous port for sail ships and was recently recognised as a UNESCO World Heritage Site,” he added. Meanwhile, Mohd Ali said the state tourism promotion division and hoteliers here would promote the ship as a tourist attraction. For a start, he said the ship would offer tourists a sunset dinner cruise on the Straits of Malacca, the busiest shipping lane in the world. “I believe Lili Marleen will attract tourists to stay in Malacca as the cruise will take five hours,” he said, adding that those wishing for more could hire the vessel for voyages to other ports in the region.